Designed to usher guests into a serene and comfortable environment, Crest Hotels features ultra-modern facilities and offers world class services at Old Airport Road Before Airforce Primary School, in the beautiful city of Jos, the capital of Plateau State. It exists only to provide excellent hospitality service and its a hub for tourists, business travellers and local and international expatriate who demand nothing but the very best. The rooms are structured into Tourist, Deluxe, Executive, Business Suite, Luxury Suite, Royal Suites and Zebra. 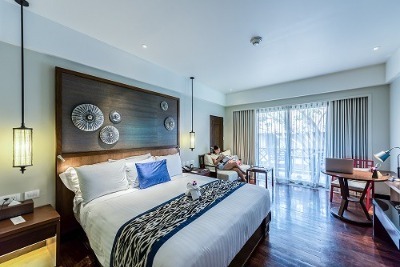 These fully air-conditioned rooms are furnished with refrigerators, televisions with satellite connections, en-suite bathrooms with bathtubs, lampshades, pillows, Crest beds, tables and chairs, dressing mirrors, toiletries and sofas. Crest Hotel’s restaurant serves a variety of delicious local and continental dishes while the hotel bar is stocked with an array of alcoholic and non-alcoholic drinks. Crest Hotels and Gardens also house an ultra-modern event centre, a swimming pool and gym for guests. Other services at Crest Hotels and Gardens include: Wi-Fi connectivity, pick up service and car hire at a surcharge, a business centre, adequate parking space and well-trained security personnel. Children: Maximum age of 12 can stay for free with their parents. Q: Does Crest Hotels and Gardens have a swimming pool? A: Yes, it has a swimming pool. Q: Does Crest Hotels and Gardens offer complimentary breakfast? A: No, Crest Hotels and Gardens do not offer complimentary breakfast. Q: Is there a fitness centre/gym at Crest Hotels and Gardens? A: Yes, there is a fitness centre/ gym at Crest Hotels and Gardens. Q: Does Crest Hotels and Gardens have a restaurant? A: Yes, Crest Hotels and Gardens have an on-site restaurant. Q: Does Crest Hotels and Gardens have onsite parking? A: Yes, it has an adequate parking space. Crest Hotels is a budget hotel in Jos, Plateau. My stay at the hotel was perfect. The reception I had while checking in was amazing, I never expected it. The staff were always attending to their guests with smiles on their faces and they were helpful. The room was comfortable and cool. I enjoyed my stay. My stay at the hotel was pleasant that I felt so comfortable extending my stay. The staff at the hotel were friendly and accommodating. Generally, the environment of the hotel was properly cleaned and it was conducive for relaxation. My stay there was excellent. The AC was good, The room service, the staff everything was just excellent! My stay at the hotel was nice. My room was clean and beautiful. I was welcomed warmly by the staff and all my needs were promptly attended to. Water and power supply was available throughout my stay and food was tasty and affordable. It was really a nice experience, I even extended my stay at the hotel. My stay was great, spending a long time at your hotel was wonderful, the service was good, the meals were delicious and fast, and your laundry guy knows how to do his job very well, I will say my experience was perfect because I was treated very nice. Have nice pictures of Crest Hotels ?